All batteries suffer when exposed to extreme heat, dependent on their chemistry some worse than others: to the point of permanent irretrievable damage. Fortunately, the Ni-MH battery chemistry within the HAWK battery can take more punishment than many forms of other chemistries found in batteries today. In saying this, it does not mean that Ni-MH batteries are excluded from this problem. All batteries self discharge and the rate of self discharge is dependent on temperature. The higher the temperature, the more the rate of self discharge will increase. Depending on their chemistry some batteries will self discharge faster than others. A Ni-MH battery (HAWK) has a self discharge rate of approximately 0.3% per day at a room temperature of 20°C: If increased, to 35°C will self discharge at a rate of 1% per day. Increase this to 50°C and the self discharge rate rises to 5% per day. Once the HAWK battery is allowed to go below its threshold voltage of 19 volts, (no output from the battery), and continue in a downwards trend to zero volts, its re-charge battery efficiency will be greatly reduced, which could be as much as 50% of its output capability i.e. 25Ah instead of 50Ah. Unlike an SLA product, the chemicals within the Ni-MH system are dissimilar. This means they cannot shed material or passivate. The HAWK battery can be brought back up to voltage by charging very slowly at C/20 then slowly discharging to about 75% capacity. Then charge again with a slightly higher rate of charge. If this method is required to bring the battery back on line it is recommended that it be returned to A.T.S.I. in order to complete this successfully. To maximize current output and reduce the risk of permanent damage to the HAWK battery in extreme temperatures it is vital to follow the procedures recommended by the manufacturer. Battery management is even more crucial in high ambient temperatures. To minimise battery problems in these conditions there is one simple rule. This will greatly reduce self-discharge and improve the charging characteristics. *(1) The fuse is fitted within a cartridge holder. Use a coin to twist slotted outer fuse holder anti-clockwise to pull cartridge out. To replace fuse remove old fuse by pulling out of cartridge and replace with new 12.5 amp FF. Slide cartridge back into housing and turn clockwise. *(2) In high ambient temperatures it is possible that the battery could over-heat This will automatically disengage the battery thermal resettable fuse. Once the temperature has cooled sufficiently inside the battery the fuse will re-set. If this does take place the gas gauge will trip out and re-set to zero. Once the battery thermal fuse has re-set, (although the gas gauge is showing a red flashing LED), the battery can still be used as it will be fully charged. If the battery charger is showing a fully charged battery, the battery will be fully charged irrespective of the gas gauge. *(3) Should the output lead be accidentally damaged causing the positive and negative, leads to short out this will blow the fuse in the battery. The "HAWK" is protected against this occurrence happening. Once the fuse and lead has been replaced, the "HAWK" will function normally without any damage having been done to the battery. Remember that if this has occurred, the gas gauge will have re-set to zero and will only correct itself on the next charge cycle. *(4) Should the equipment being used require more than 12.5 amps current draw, the only way to resolve this issue is to connect two "HAWK" batteries through a two in one Y lead or parallel junction box, (not the RMPARBU/24-6 unit) this will increase battery output to 25Ah. *(5) Equipment that the battery is connected to could have developed a fault causing current draw to rise significantly. It must be understood that a battery cannot damage or cause a fuse to blow, (unlike a power supply), within the equipment, provided the equipment is rated for that power source,(i.e. voltage is correct) A battery's maximum voltage capability cannot rise, it can only descend A mains power supply could damage equipment should the power supply become faulty or be set incorrectly. *(6) The gas gauge is autonomous to the battery and as such is only a reference device. The "HAWK" battery will function normally with or without the gas gauge operating correctly. If the gas gauge chip temperature reaches 70°C or above it will shut down and re-set itself to zero, irrespective of the state of charge of the battery. 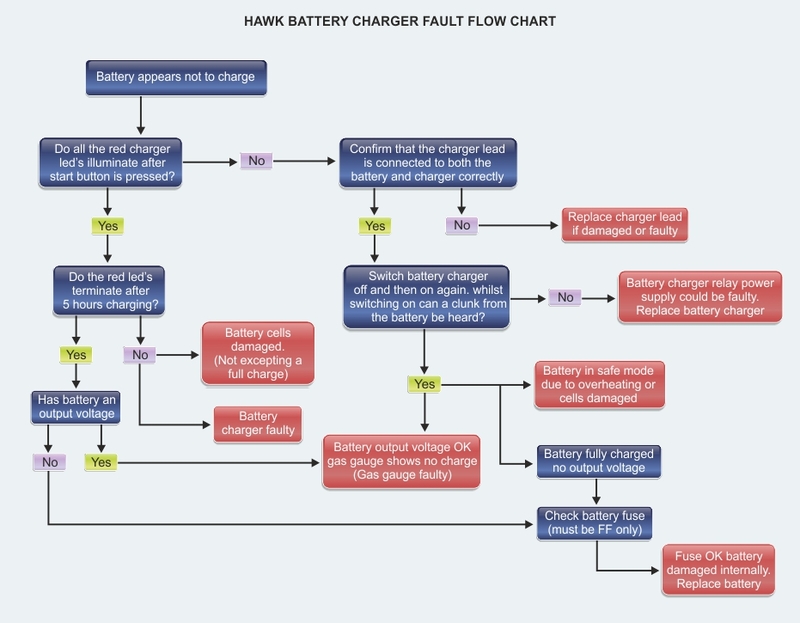 Provided the battery charger has charged the "HAWK" battery fully (indicated by the red flashing LED on the charger), the battery can be deployed in the normal fashion. *(7) Should the "HAWK" battery be left in storage for a long period of time, or be subject to extremes of heat, it is possible for the gas gauge to go out of synchronization giving the operator false readings. This will not effect the operation of the battery and will re-calibrate itself once the battery has gone through a full discharge/charge cycle. *(8) The gas gauge is autonomous to the battery and as such is only a reference device. If the gas gauge chip temperature reaches 70°'C or above it will shut down and re-set itself to zero, irrespective of the state of charge of the battery. Provided the battery charger has charged the "HAWK" battery fully (indicated by the red flashing LED on the charger), the battery can be deployed in the normal fashion.